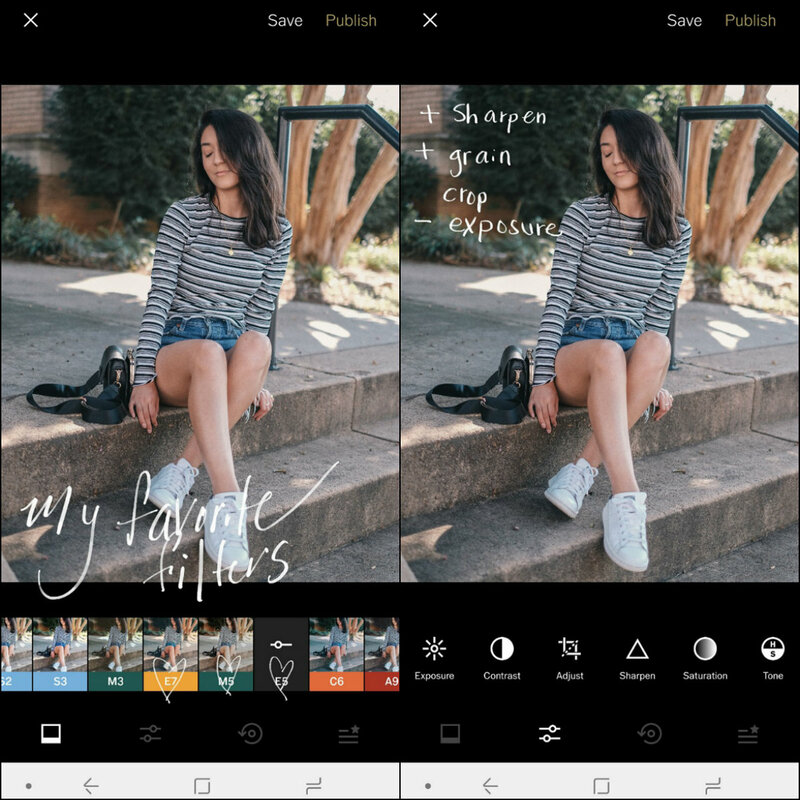 So many of you have reached out to me asking how I edit my instagram photos so today's post is dedicated to showing you all my favorite apps and editing tips. It's nothing complicated at all, honestly, I could probably just use VSCO and be completely fine. 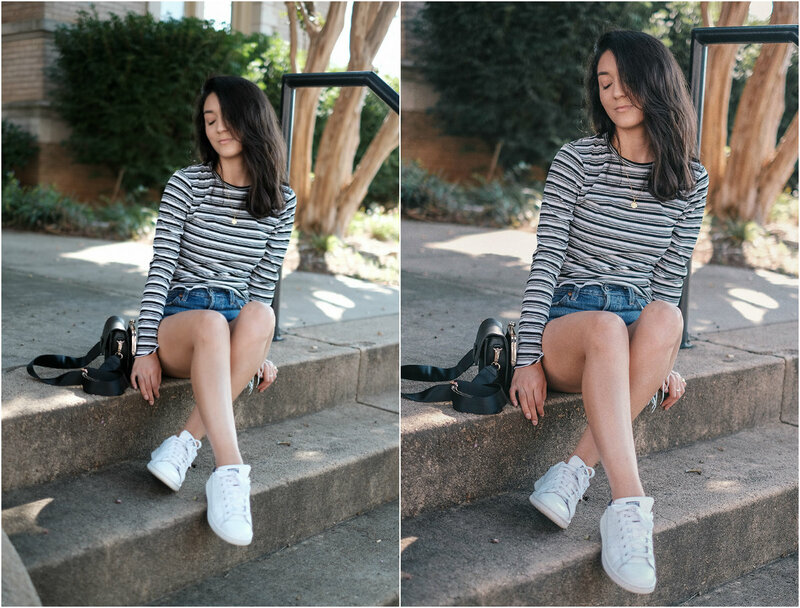 The way I edit depends on the photo but for the most part, I try to stick to the same filters so that my feed flows and feels cohesive. My must have editing apps are VSCO and Lightroom. Facetune and Snapseed are really good too but I don't use them every time. Step 1: Import photo into the Lightroom app. From here I will first edit the lighting, vibrance, saturation, colors, etc. 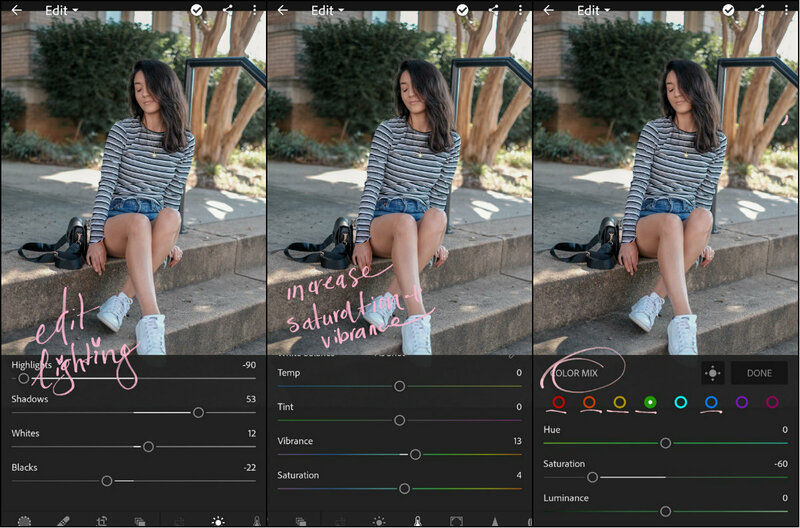 This app is really perfect for pulling little details, like bringing up the saturation in your dress, enhancing your skin tone, etc. 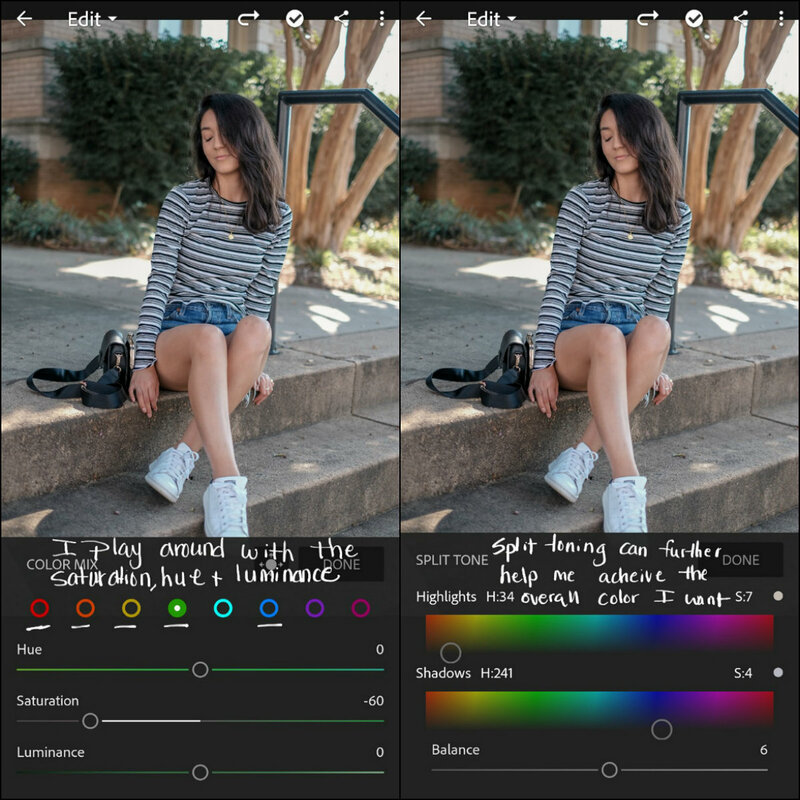 Another fun tool I like using in this app is split toning, which lets you pick the hue of your highlights and shadows. I tend to go for pinks/oranges/purples. Lastly, I will save the photo. Step 2: I open up the photo in VSCO. This is the fun part and what gives my photos their overall feel! My top 3 filters are E7, E5, and M5. E5 gives my photos a pink tint that I love and is my most used filter. E7 is similar to that one but makes my skin pop more! And M5 is like a soft, muted filter which I love to layer with and is great for flat lays. One thing I have found when I can't decide which filter to use is to layer them up! This way I can get what I love from both without settling for only one. You just have to apply your first filter, save it, upload it, then apply your next filter. Next, I give my photo it's finishing touches. I will crop it to fit Instagram, add grain and increase sharpness. Occasionally I will need to whiten/desaturate objects or backgrounds and that's when I would use Snapseed and Facetune. I also really love the details feature on Facetune, it's perfect for making jewelry/accessories pop. From here I will upload it to my LIKEtoKNOW.it and link up all the products I'm wearing for you guys to shop. Be sure to follow me on the app to be the first to see my looks! That's it! I told you guys it was pretty simple. Now it's your turn! Let me know if there's any photo editing app that I need to try or let me know your favorite filters!